Savannah is Dine, of the Edgewater Clan. Born of the Water Flowing Together Clan, her maternal grandfather is of the Folding Arm Clan and paternal grandfather is of the Red Bottom Clan. 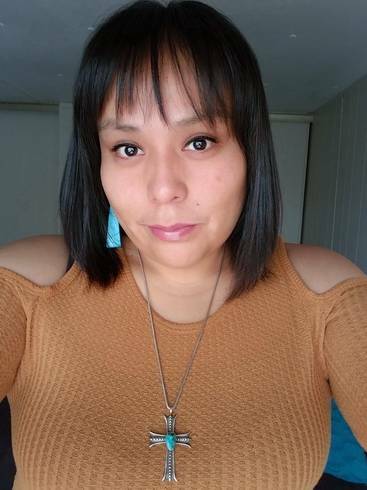 Her parents, Edwin and Roaslie Bigboy, raised the family in the Four Corners area in Cortez, Colorado, moving back to the reservation when she was 5. Savannah attended a boarding school in Dennehotso, Arizona, while her father worked as a truck driver and her mother was a Certified Nursing Assistant. Her love of art began in junior high and high school art classes. When Savannah was in 7th grade, she went to New York City for a student exchange program, where she toured the city, a few history museums and some schools. What struck her most were the art schools and art museums, where she was introduced to Monet, Warhol, Pollock, Van Gogh and many more. She was still drawn to art history classes while in college, although she majored in criminal justice. Both grandmothers and her mother were and are weavers. They taught her some weaving during the summers she spent with them. Her grandmothers are major contributors to Savannah's style of painting as well. They taught her what it was to be an artist and a Dine woman. Rena Benally is Savannah's maternal grandmother and Yovanno Bigboy is her paternal grandmother. Savannah is currently on the adventure called life, working in National Parks as a server. She loves to travel and hike. In between it all she paints, always influenced by what she sees or may remind her of things she saw as a kid. Things like the Northern Lights, which she got to see when coming out of a ceremony with her sister for a break. She was 12 and was the first time she had seen the Northern Lights this far south. She is a traveler, wandering soul, and an artist.